Look no further for a mixed martial arts style that teaches the most effective drills, strategies and techniques from over 30 different martial arts and wrestling styles. Grandmaster Jody Perry's mixed martial arts style, Perry's Full Circle, optimizes the natural talents of martial artists, grapplers, and wrestlers. PFC fighters compete nationally and internationally in multiple sports, including Sambo, Pankration, Sport Jujutsu, Grappling, Cage Fighting, Self-Defense. 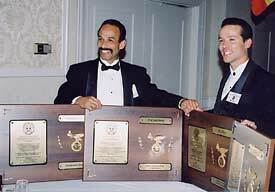 In 2001, the Perry's Full Circle style was officially recognized by the World Martial Arts Hall of Fame. Grandmaster Perry was awarded a Sokeship and a Ph.D. / M.A. by the WMAHOF Council. The goal of Perry's Full Circle (PFC) is to teach self-defense and train martial artists to step into athletic stardom by competing for a National, World Team, or Olympic berth in Sambo, Sport Jujutsu, or Pankration. Without question, we have all come to realize that our cities and towns are not as safe as they used to be, night or day. Because of this, it has become necessary for many people to seek some sort of self-defense for their own protection and/or for the protection of their loved ones, should they ever have to defend them. Our objective in self-defense training is not to stand and fight toe-to-toe with an assailant, but to ward off the assailant and/or escape the assailant's grasp, inflicting only as much injury as necessary to do so. The PFC program incorporates selected or modified drills, strategies and techniques from over 30 different martial arts styles and 3 styles of wrestling / grappling. PFC is a competition-based system; in order to advance in rank, students must compete in tournaments as well as master the skill sets for each belt level. By combining experience, positive energy and humor to build self-esteem, confidence, respect, and discipline, PFC produces versatile, highly skilled martial artists trained to their personal peak. As a competitive athlete and coach for over 35 years nonstop, I have experienced the thrill of adventure, travel, and the physical, mental psychological and spiritual growth and development that serious athletic training can bring. After winning the Sambo World Championships (1995, St. Jean de Luz, France) I can honestly say that I have had my "cup runneth over" many times. I believe that my life was shaped by the athletic programs I chose. I believe that sports and athletics kept me off the streets and out of trouble, as well as keeping me young enough to stand toe-to-toe with competitors half my age. Athletic involvement has been one of the greatest and most positive influences in my life. There is no feeling like the thrill of giving your all, regardless of winning or losing.